RARE ~~ EDITION LIMITED TO ONLY 40 IN THE WORLD! Highly textured, lavish highlighting, sketched at the back. Edition Size limited to ONLY 40 in the world! Premium Studio Proof Gold Museum Quality Frame ~~ ready to hang! TKC determined that they will no longer publish unfinished Renaissance, Studio Proof and Master Editions! This means that because these editions are being retired and will never be made again, their value will go out the roof. RARE! ONLY 40 IN THE WORLD! 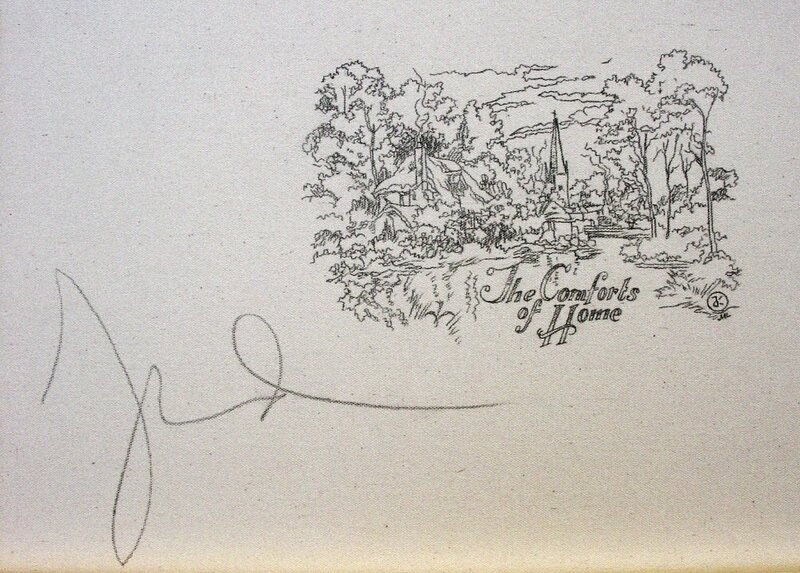 This artwork is now found in only private collections and is not often available. +++Thom placed over 300 hours of work in Pinocchio Wishes Upon a Star. Make note of all the detail in this painting, including the cobblestone road. +++This is without a doubt one of Thom’s most detailed works. ++++Thom used a state-of-the-art magnifying glass in order to place more detail in this piece than any other image in his 25 years as a published artist. You'll need one as well! 1. 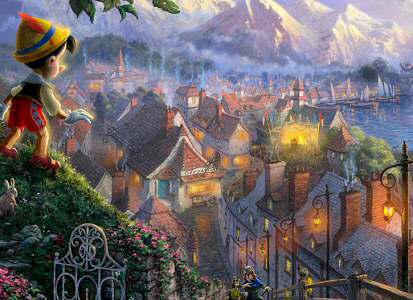 Pinocchio is the second release in Thomas Kinkade's Disney Dreams Collection. 2. Thom has placed a total of 25 N's in Pinocchio Wishes Upon a Star as tribute to his love for his wife Nanette, as well as in celebration for his 25 years as a published artist. 3. Thom has incorporated many hidden Mickeys in Pinocchio Wishes Upon a Star. Can you find them all? 4. Take a look at the far right side of Pinocchio Wishes Upon a Star and you will see Pleasure Island, as well as the whale, Monstro! 5. 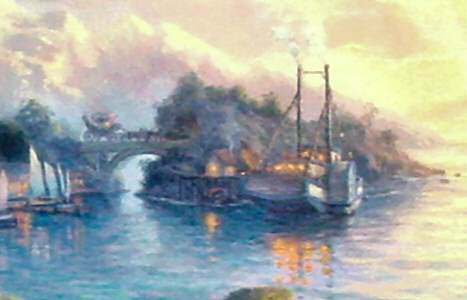 Thom has recreated a fanciful scene in this painting, based on original sketches that the movie backgrounds were based on. 6. The natural bridge featured in this work is not in the movie, but Thom placed it in the painting as a symbol of the passage of time. 7. Thom has incorporated important characters from the movie into Pinocchio Wishes Upon a Star. Is that Honest John and Gideon coming up the walkway? 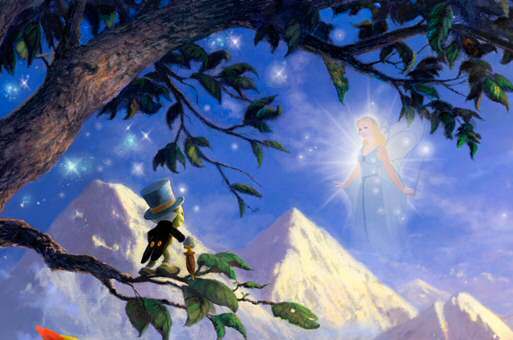 Can you spot the Blue Fairy, which per Thom, is a symbol of hope? 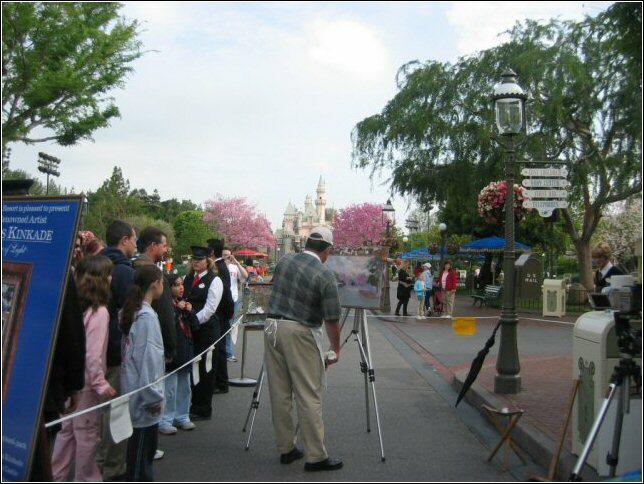 Jiminy Cricket is also somewhere in the painting. Can you find him? 8. Thom has placed the letter W in Pinocchio Wishes Upon a Star as tribute to his daughter, Winsor. .... and many other surprises! ++++ Thom released this painting in 2009. ++++ SP-Gold Museum Quality Frame INCLUDED ~~ ready to hang! ++++ Brass Plaque with the legend "Pinocchio Wishes Upon a Star ~~ Thomas Kinkade"
My "Disney Dreams Collection" celebrates great moments from Walt Disney Films. I call these paintings "narrative panoramas" because each painting tells the entire story of the film in one image. 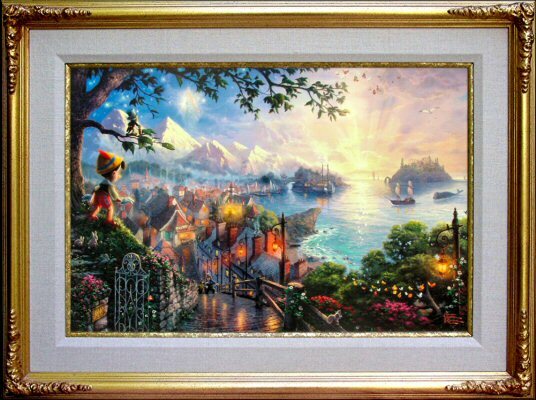 For my painting "Pinocchio Wishes Upon A Star" we see Pinocchio upon a hillside overlooking the setting of his adventures. 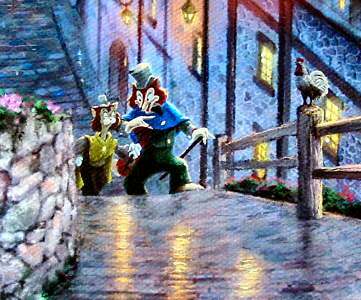 We see Honest John and Geppetto's workshop where Pinocchio was formed. On the right we see Pleasure Island and Monstro the whale preparing to engulf Geppetto's sailing vessel. Butterflies and sparkles lend magical accents as the Blue Fairy and Jiminy Cricket look on. 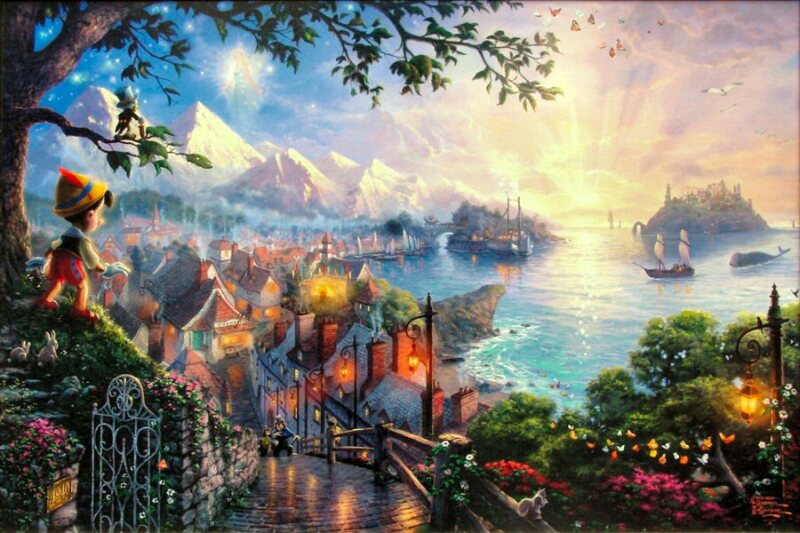 My prayer is that my "Disney Dreams Collection" will make dreams come true for all who see these enchanted paintings."